The DYD Coaching Apprenticeship programme is a unique professional development course for freediving instructors. The course enables instructors to develop their skills from teaching standardised certification programmes to intuitively working with students of all levels to deliver personalised programmes. By developing your coaching skills you will be able to make a difference not only for the student's technique and diving skills but for their understanding and implementation of more effective mental processes both in and out of the water. Of course these skills will also have huge benefits for your own diving performance. Certified instructors from any programme are welcome to apply for the Coaching Apprenticeship Programme, and while it helps to already have a knowledge of yoga and meditation, it is not essential. You must be comfortable diving to at least 50m to qualify for the programme, and have at least one year's teaching experience and have taken part in at least one competition. 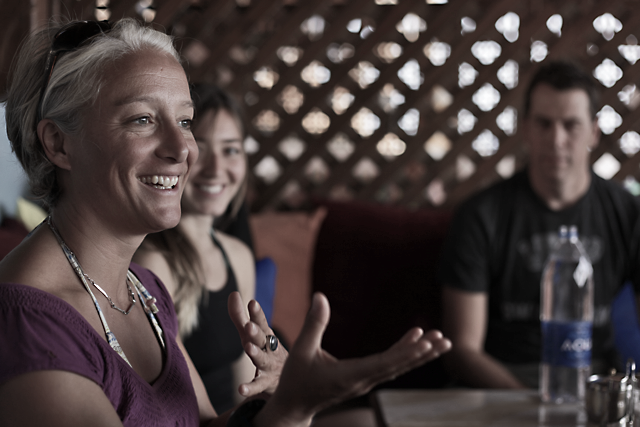 Also, you must be fully fit for diving (comfortably diving to within 10m of your PB), have an up to date medical certificate clearing you for freediving (obtainable here in Dahab from the hyperbaric doctor), as well as a current CPR certificate and full freediving teaching insurance. Working with Sara was probably one of the best experiences I had since I started working as a freediving instructor. She taught how to work together with students from an integral and more spiritual point of view. Sara is a great coach and a very generous teacher. She helped me to develop my emotional intelligence and gave me the confidence to venture into opening my own freediving school. Please contact us for an application form if you are interested in this ground-breaking training opportunity.